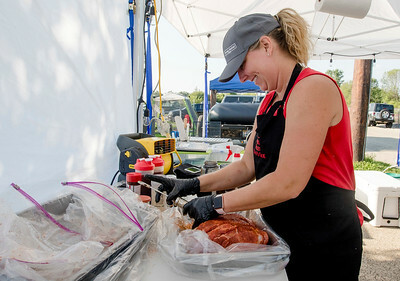 Sarah Nader - snader@shawmedia.com Sandy Brown with Stress Relief out of Rockford prepares pork for pulled pork while competing in the inaugural cook-off sanctioned by Kansas City Barbeque Society at the McHenry Rotary Blues, Brews and BBQ in McHenry Saturday, Aug. 19, 2017. Judging will be held for chicken, pulled pork, brisket and ribs at the professional-level sanctioned state championship on Sunday. 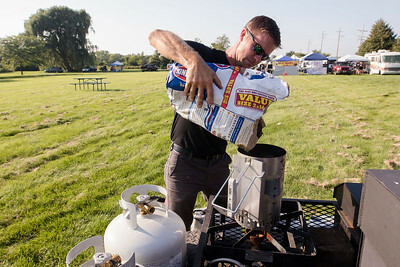 Sarah Nader - snader@shawmedia.com Josh Barnett with Old World Smoke and Barrel out of Wonder Lake, fires up his grill while competing in the inaugural cook-off sanctioned by Kansas City Barbeque Society at the McHenry Rotary Blues, Brews and BBQ in McHenry Saturday, Aug. 19, 2017. Judging will be held for chicken, pulled pork, brisket and ribs at the professional-level sanctioned state championship on Sunday. 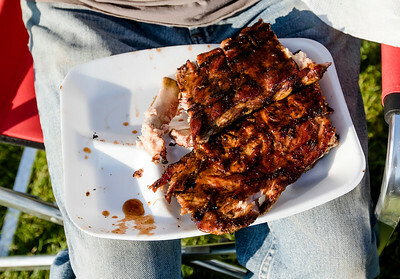 Sarah Nader - snader@shawmedia.com Duane Blocker of McHenry chows down on a plate of ribs with his wife while attending the McHenry Rotary Blues, Brews and BBQ in McHenry Saturday, Aug. 19, 2017. The fest runs through Sunday and features the best in blues music, home brewing and barbecue cooking.